Robometricschool. 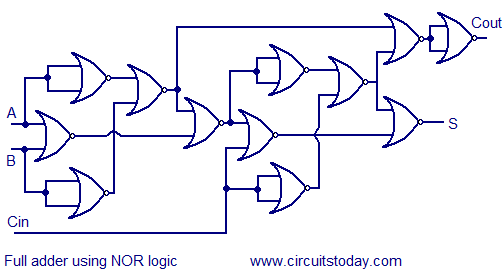 - This is one of the application of NAND and NOR logic to build full adder for you. Before you can build full adder with combining two half adder using logic circuit. 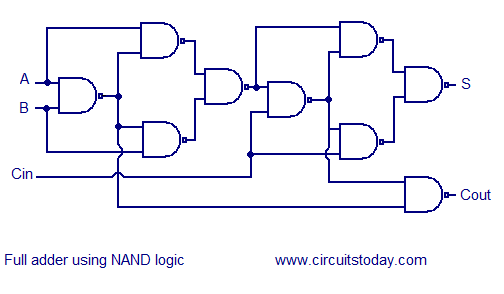 In here we will show you two circuit schematic of full adder using NAND and NOR logic look like shown in Figure 1 and Figure 2 below. There is a simple trick to find results of a full adder. Consider the second last row of the truth table, here the operands are 1, 1, 0 ie (A, B, Cin). Add them together ie 1+1+0 = 10 . In binary system, the number order is 0, 1, 10, 11……. and so the result of 1+1+0 is 10 just like we get 1+1+0 =2 in decimal system. 2 in the decimal system corresponds to 10 in the binary system. Swapping the result “10” will give S=0 and Cout = 1 and the second last row is justified.